The above, from our November 2012 StorInt Performance Dispatch, is another of our ChampionsCharts™ showing optimum storage performance. 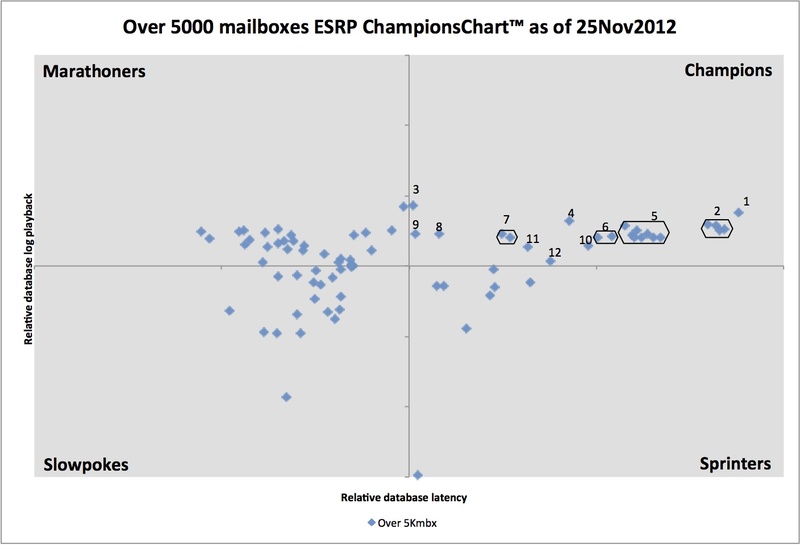 This one displays the Q4-2012, Exchange Solution Reviewed Program champions for the over 5,000 mailbox solutions. All of SCI’s ChampionsCharts are divided into four quadrants, the best is upper right and is labeled Champions, the next best is upper left and is labeled Marathoners, then Sprinters and finally Slowpokes. The ESRP chart shows relative database latency across the horizontal axis and relative log playback performance on the vertical access for all ESRP submissions for the over 5,000 mailbox category. Systems provide better relative log playback performance the higher in the chart they are placed and better relative database latencies the further to the right one goes. We believe that ESRP performance is a great way to see how well a similarly configured storage system will perform on the more diverse and mixed workloads seen in every day data center application environments. All SCI ChampionsCharts represent normalized storage performance for the metrics we choose and as such for ESRP indicates that given the hardware used in the submission, Champions performed relatively better than expected in both log playback and database latency. Marathoner systems performed relatively better in log playback and not as well in database latency. Similarly, for the Sprinters quadrant, these systems provided relatively better database latency but worse log playback performance. In the Slowpokes quadrant these systems performed relatively worse on both performance measures\. • Group 1 is a single system and is the IBM DS8700, which had both best relative log playback and database latency in their group of storage systems. The IBM DS8700 was configured to support 20,000 mailboxes. • Group 2 represents four storage systems of which two are the HDS USP-V (the previous generation of HDS VSP enterprise class storage) and the other two HDS AMS 2100 storage systems (the previous generation entry-level, mid-range class storage systems from HDS). The two USP-V systems were configured for 96,000 and 32,000 mailboxes respectively. The two AMS 2100 storage systems were configured to support 17,000 and 5,800 mailboxes respectively. • Group 3 represents a single storage system and is the HP4400 EVA configured with 6000 mailboxes. The November ESRP Performance Dispatch identified top storage system performers for both the 1,001 to 5000 and 1000 and under mailbox categories as well. More performance information and ChampionCharts for ESRP, SPC-1 and SPC-2 are available in our SAN Storage Buying Guide, available for purchase on our website. The complete ESRP performance report went out in SCI’s November 2012 newsletter. But a copy of the report will be posted on our dispatches page sometime this month (if all goes well). However, you can get the latest storage performance analysis now and subscribe to future free newsletters by just using the signup form above right.